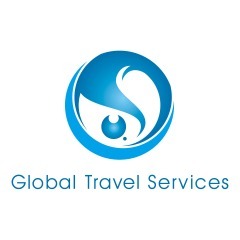 Global Travel Services Cairns (GTS) is a local owned company with roots in the Cairns and Far North Queensland region spanning 20 plus years. Specialising in Private Coach Charters we have a fleet of 35 coaches varying from 8 to 54 seaters. 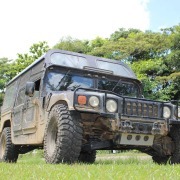 As well as this we’ve developed two flagship tours: the Day/Night Rainforest, Waterfalls and Wildlife Tour featuring the famous Paronella Park and our Kuranda Tour with a variety of packages available to suit all travellers. We pride ourselves here at GTS on our punctuality, professional appearance, flexibility, people skills, safety standards and kindness. Our goal is to give passengers a taste of good-old friendly North Queensland hospitality. See the World Heritage Rainforest in an unforgettable way! 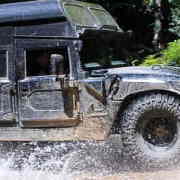 Visit some of the most pristine Rainforest only a stone’s throw from Cairns in either a H1 Military Hummer or riding your very own ATV 4 Wheel Buggy (no experience required). 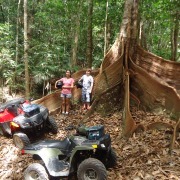 See the most amazing tree giants including a HUGE Curtain Fig Tree when we take you OFF ROAD in our 4WD Bus!! 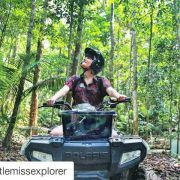 You’ll even have a chance to spot native wildlife including the normally elusive Cassowary (World’s 3rd largest flightless bird – 1.6m). 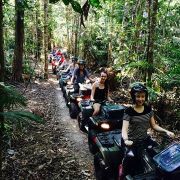 This unique experience is the perfect way to add some excitment to your Cairns visit – family friendly!